JAHNU Barua’s Har Pall is the story of two flight attendants Shweta (Ishaa Koppikar) and Runa (Preity Zinta), who work with an international airline and share a one-bedroom flat in Mumbai. They both like their neighbour Rohit (Shiney Ahuja). Rohit and Runa are fond of each other but Runa is engaged to Gautam (Dharmendra). Rohit often finds Runa fighting with her fianc`E9 on the phone. Rohit sympathises with Runa. Runa keeps him hopeful of a possible relationship. When Rohit goes to Shillong regarding his ad film, he is in for a surprise as he finds that Runa had been concocting the relationship and there is no one at the other end of the phone. Producer-director Afzal Khan’s Mehbooba (2008) was the story of two brothers in love with the same girl. The advances Shravan (Sanjay Dutt) from New York are spurned by his employee Varsha (Manisha Koirala) who slaps him during a party. Shravan apologises and tries to woo her. She relents only to find that he was avenging his insult. Shravan slaps her. Varsha moves to Budapest and falls in love with Karan (Ajay Devgan), a painter. Varsha, now known as Payal, reveals to him that ‘Ek shaitan ne mera sub kuch loot liya hai’. Finally, Karan and Varsha decide to get engaged. However, on the engagement day, Payal finds that Karan’s elder brother is none other than Shravan. Gulzar’s Ijaazat (1986) was a mature tale of love where the characters did not indulge in recriminations when their relationship turned sour. Mahendra (Naseeruddin Shah) was engaged to Sudha (Rekha). Fissures appear in their relationship when Maya (Anuradha Patel) comes in Mahendra’s life. He starts living with Maya but marries Sudha under family pressure. Before marrying her, he admits his affair with Maya. When Maya comes back in his life, Sudha tries to save her marriage but is unable to do so. Finally Sudha leaves Mahendra and marries Shashi Kapoor. Meanwhile, Maya too, dies in an accident. After several years, Sudha and Mahendra meet in the waiting room of a railway station. A sense of guilt weights on Mahendra’s mind. In Karan Johar’s Kuch Kuch Hota Hai (1998), Rahul (Shahrukh Khan) and Anjali (Kajol) are buddies in college. When Tina (Rani Mukherjee) joins college, she wins Rahul’s heart and he ends up confessing his love for Tina to Anjali. A heartbroken Anjali leaves the college and Rahul marries Tina. Tina dies after giving birth to a daughter. Before her death, Tina writes letters to her daughter. Every year, the daughter opens a letter. It is in the eighth letter that she comes to know that Anjali and Rahul were great pals. She conspires with her grandmother to bring Anjali and her father together. In Yash Chopra’s Silsila, Amitabh Bachchan has to marry his dead brother’s betrothed Jaya Bahaduri although he loves Rekha whom he had wooed with poetry and roses. In the confrontation between Jaya and the former beloved Rekha, the conflict is presented as a tussle between the rights of wife and love of a woman. Mahesh Bhatt’s Arth (1982) traced the metamorphosis of a wife into a self-dependent, decisive body of dissent. Pooja (Shabana) walks out of her marriage when she discovers that her husband Inder (Kulbhushan Kharbanda) is involved with an actress Kavita (Smita Patil). Pooja presented a contemporary picture of an Indian woman who is able to hold self-esteem above all else. 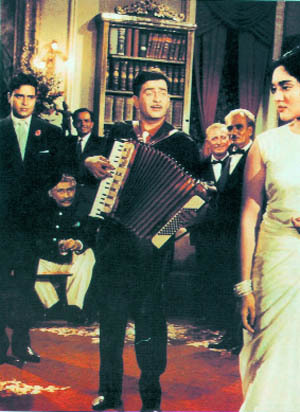 Raj Kapoor’s Sangam (1964) was a tale of love, friendship sacrifice. Gopal (Rajendra Kumar) and Sunder (Raj Kapoor) love their childhood friend Radha (Vyjayantimala). Sunder, an Air Force officer, goes missing during a rescue mission and is presumed to be dead. However, Gopal refuses to marry Radha as he cannot betray his dead friend. Sunder miraculously returns and marries Radha. Their relationship is ripped apart when Sunder discovers a love letter written to Radha and she refuses to divulge the name of the writer. Ultimately, Gopal admits that that the letter had been written by him and he shoots himself. While romantic triangles usually call for sacrifices, Yash Chopra’s Darr (1993) turned the conventions upside down. Rahul (Shahrukh Khan) played psychopathic lover who carves Kiran’s (Juhi Chawla) name on his chest with a knife. Kiran got married to Sunil (Sunny Deol) a naval officer. When they go on their honeymoon, Rahul follows them and kidnaps Kiran after stabbing Sunil and forces her to marry him. In Mahoob Khan’s Andaaz (1949) Neeta (Nargis) has a platonic friendship with Dilip. She was in love with Rajen (Raj Kapoor) whom she marries. Dilip confesses his love for Neeta but she stays true to Rajen. After marriage, Rajen gets increasingly suspicious of Neeta’s relationship with Dilip, which culminates with Neeta killing Dilip. She is tried for murder but Rajen remains unconvinced of her loyalty until it is too late.